This is my wife's favorite wing sauce. It has some sweetness, but then a little heat. She is not from the south like I am, and she says it isn't too hot. 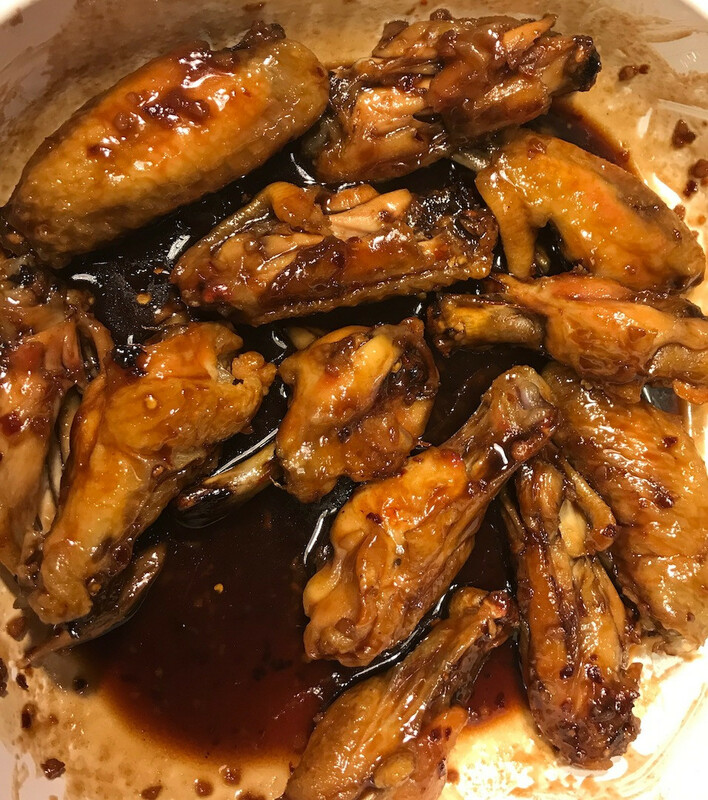 Preheat the oven to 325 degrees F. Heat 3 inches of canola oil in a heavy pot to 375 degrees F.
Add half the chicken wing parts to the oil and fry them until they're golden brown and fully cooked, 5 to 7 minutes. Remove and drain on paper towels. Repeat with the other half of the wing parts. Preheat the oven to 350. Place wings on a broiler pan so that the grease can drip through. Bake for 45 minutes or until the wings are done. Add the jelly to a bowl. Then stir in the soy sauce and rice wine vinegar. Add the brown sugar, ginger, red onions, garlic, red pepper flakes and hot peppers. Stir to combine, and then pour it into a saucepan and bring to a boil over medium-high heat. Reduce the heat to medium-low and cook the sauce until slightly thickened, about 15 minutes. Then turn off the heat. Place the wings in an ovenproof dish and pour the sauce over the top, reserving some sauce for serving. Toss to coat, and then bake in the oven for 15 minutes.